distribution Nearly statewide, though apparently absent from the northeastern and far eastern parts of the state. No records east of Hertford, Martin, and Craven counties. Of spotty distribution in the southwestern mountains, for no obvious reason, as the species occurs over most of the eastern US. abundance Generally fairly common in the mountains and foothills, uncommon to fairly common over most of the Piedmont, but uncommon in the Coastal Plain. Despite its very wide range, found in most NC counties, it is seldom really common and not nearly as often seen as the Lancet and Ashy clubtails (though the Dragonhunter flies later in the season than those two). flight Mainly from mid-May (rarely as early as late April) to late September; most often seen from early June to early September. habitat Generally breeds at swift-flowing streams and rivers, rarely at lakes. Prefers forested waters as opposed to very wide, sunny streams. behavior Males often patrol conspicuously up and down the middle of a river or large stream, easily recognized by its very large size and unusual habit of curling the tip of the abdomen downward into a "J" shape. They also perch on bare ground and vegetation, at times allowing for easy observation. comments This is one of the largest of all dragonflies, and the male's habit of flying with the abdomen tip curled in a "J" shape makes it undoubtedly the easiest of the clubtails to identify on the wing. 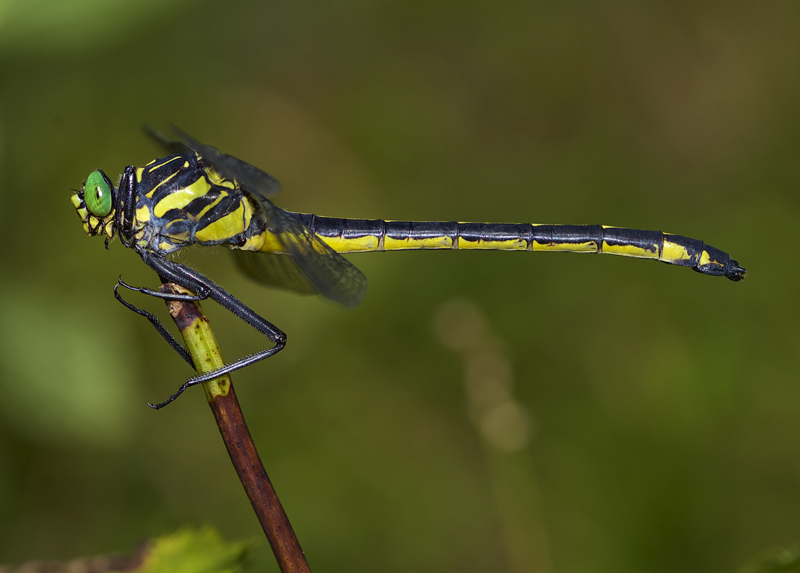 As the common name implies, it is quite predatory on other species of dragonflies, their main quarry. The species is monotypic -- the only species in its genus. Comment: Graham, 2017-07-19, Cheoah River just below Santeetlah Dam at the boat launch. - Male. Preying on male Widow Skimmer. First record for Graham. Comment: Jones, 2017-06-24, - Two females spotted attacking other odonates and perching along the Trent River. Comment: Yancey, 2016-07-26, Along Dam Road and the Cane River in Burnsville. Comment: Onslow, 2015-08-15, - Single female found ovipositing in Cowhorn Creek. Comment: Buncombe, 2015-06-06, Small creek off Lower Flat Creek.